New data from the MUSE instrument on ESO's Very Large Telescope in Chile has revealed a remarkable ring of gas in a system called 1E 0102.2-7219, expanding slowly within the depths of numerous other fast-moving filaments of gas and dust left behind after a supernova. This discovery allowed a team led by Frédéric Vogt, an ESO Fellow in Chile, to track down the first ever isolated neutron star with low magnetic field located beyond our own Milky Way galaxy. The team noticed that the ring was centred on an X-ray source that had been noted years before and designated p1. The nature of this source had remained a mystery. In particular, it was not clear whether p1 actually lies inside the remnant or behind it. It was only when the ring of gas — which includes both neon and oxygen — was observed with MUSE that the science team noticed it perfectly circled p1. The coincidence was too great, and they realised that p1 must lie within the supernova remnant itself. 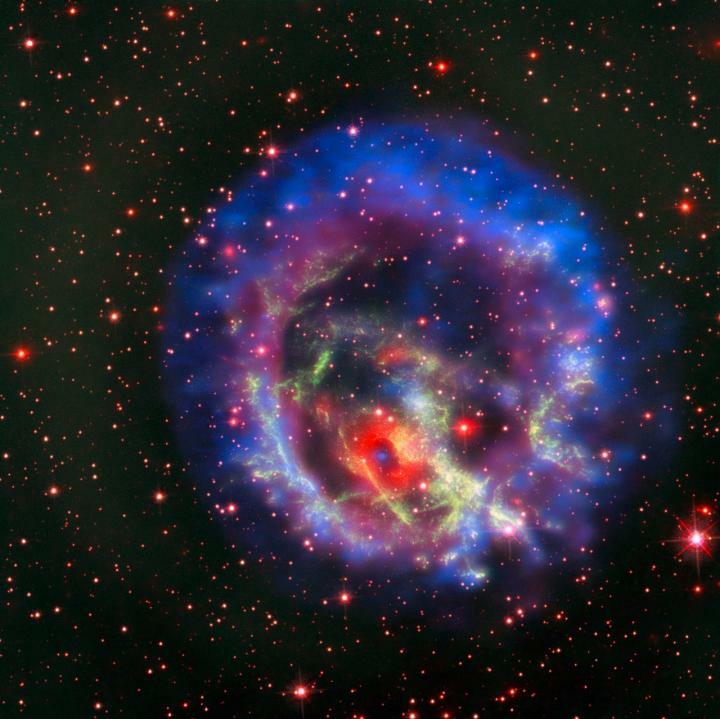 Once p1's location was known, the team used existing X-ray observations of this target from the [Chandra X-ray Observatory] – http://chandra.harvard.edu/ to determine that it must be an isolated neutron star, with a low magnetic field. In the words of Frédéric Vogt: "If you look for a point source, it doesn't get much better than when the Universe quite literally draws a circle around it to show you where to look." Co-author Liz Bartlett, another ESO Fellow in Chile, sums up this discovery: "This is the first object of its kind to be confirmed beyond the Milky Way, made possible using MUSE as a guidance tool. We think that this could open up new channels of discovery and study for these elusive stellar remains." The image combines data from the MUSE instrument on ESO's Very Large Telescope in Chile and the orbiting the NASA/ESA Hubble Space Telescope and NASA Chandra X-Ray Observatory. This research was presented in a paper entitled "Identification of the central compact object in the young supernova remnant 1E 0102.2-7219", by Frédéric P. A. Vogt et al., in the journal Nature Astronomy.